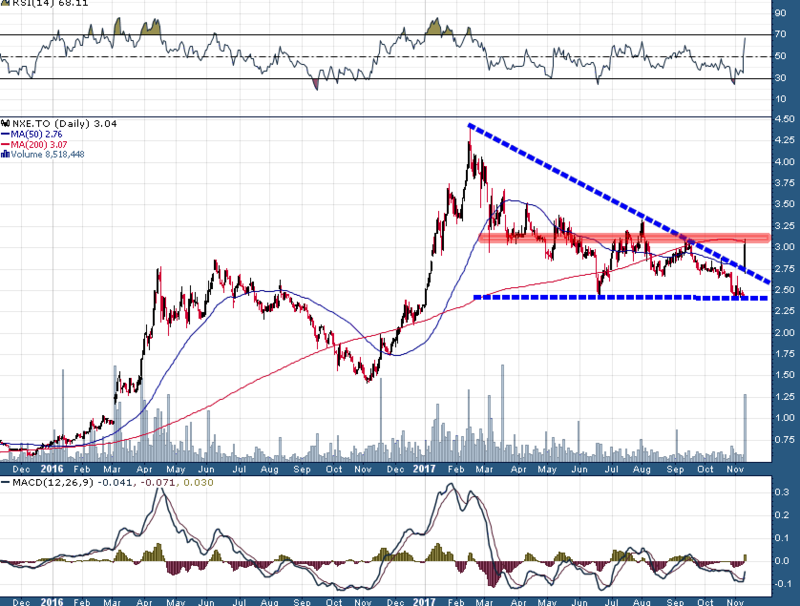 Uranium Sector Erupts – Four Must See Charts | Energy and Gold Ltd.
It’s still early for this month of November, however, URA’s upside move this week is already the strongest rally from an oversold condition (to an ‘overbought’ condition), in such a short period of time (4 days), in the history of the URA exchange-traded fund. 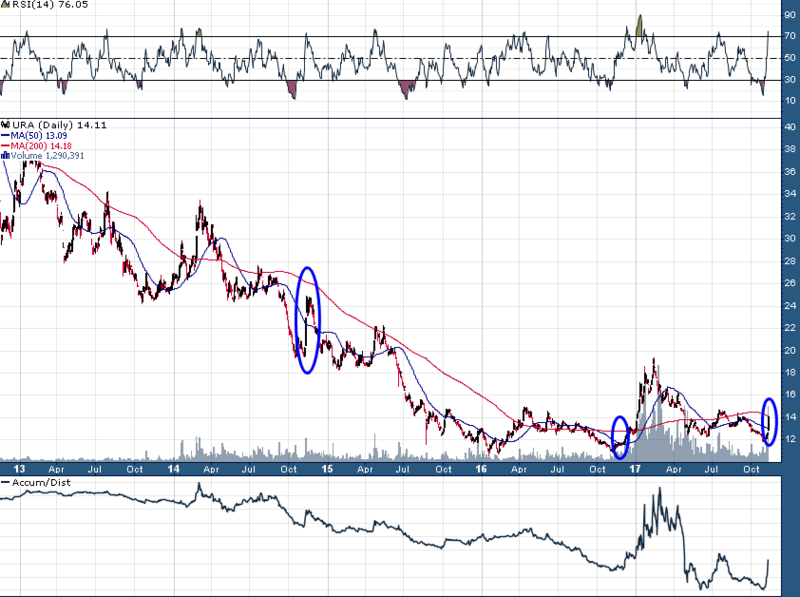 Since reporting disappointing earnings on October 27th Cameco shares have seen steady accumulation, and today’s lower-to-higher reversal is a strong sign that institutions are beginning to bet on a turn in the uranium sector. Today’s move in NXE is particularly significant from a technical standpoint as NXE broke out to the upside from a large multi-month descending triangle by way of an opening gap (trend line breaks by way of gap carry greater significance). Moreover, NXE shares closed near session highs on the heaviest trading volume since March. NXE faces some minor resistance near C$3.10, however, today’s price and volume action offers a strong probability that an intermediate-term low has been put in place and a new leg higher has begun. 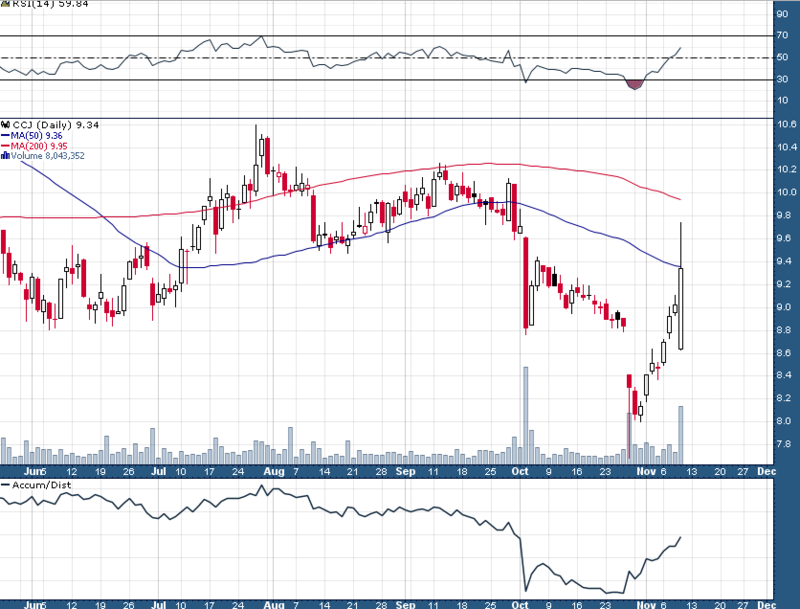 The all-time high at C$4.45 would be considered a minimum upside objective for this next leg higher. Disclosure: Author is long CCJ and NXE shares at time of writing and may buy or sell at any time without notice.